5" aluminum screw posts are designed for binding very large books. For books and other projects that require a longer post, they can also be extended to almost any length with our screw post extensions. For binding documents this thick, it's a good idea to obtain posts that are slightly longer than the thickness of the book. This will leave room to open the inner pages a bit better, and will make the screws hold better. The post length is 5" and the diameter is 3/16". The post length is the maximum binding thickness (inside length.) We recommend that you measure the total thickness of the materials that you are binding to obtain the best fit. We also recommend that you punch or drill a 1/4" hole in your documents to accept these posts. Posts are 3/16" diameter. The overall length of a post with the screw installed is approximately 5 1/8". 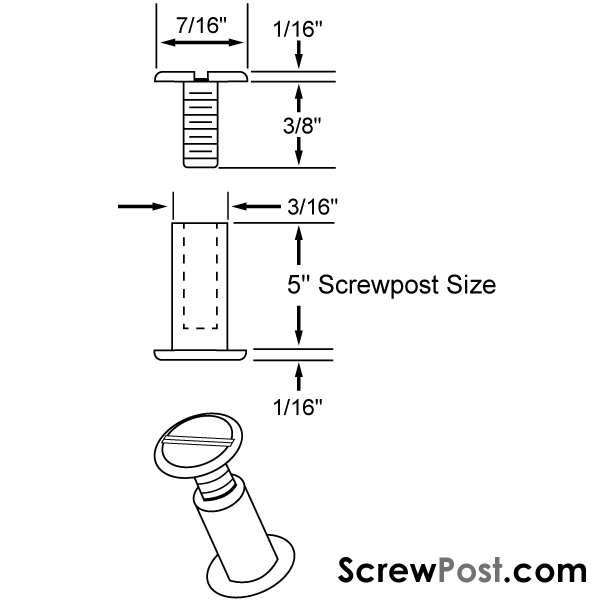 These screw posts can be extended using our 1/2", 3/4", and 1" screw post extensions. 1/4" screw post extensions may also be used with the addition of 3/16" screws (the 3/8" screws furnished with these screw posts are too long to work properly with 1/4" screw post extensions.